After producing their British parade sets, Airfix began their line of battle figures with a set of German Infantry and one named 'Infantry Combat Group', both for World War II. The Infantry Combat Group was a generic 'Allied' infantry set to go against the Germans, and is reviewed here. 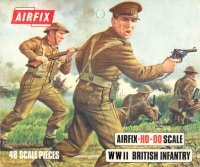 When Airfix came to update their crude early sets, this set became the British Infantry that we see above (sometimes also known as 'Type 2 British Infantry'). There are some nice poses in this set - poses that you rarely see. The man carrying the Bren gun on his shoulder is unusual, as is the man kneeling with Bren at his side. The third figure in the top row is not convincing in our view, and nor are we fans of the first in the second row as both are fairly poor attempts at depicting a human moving quickly. Airfix made stretcher parties in several early sets, and in this case they have gone to the trouble of making different figures for front and back. The officer with the peaked cap is something of a cliche, and not very likely on the field of battle. As with most other British Infantry sets that came before or after, the troops here are wearing the standard British battledress and Mk I / Mk II helmet that saw service throughout the War. However although the BD was loose to allow easy movement (and sometimes so loose as to look dreadful), on these figures it is virtually skin-tight - the trousers look like breeches more appropriate for the Napoleonic Wars than anything in the 20th Century. Webbing is almost non-existent. The front pouches are not particularly accurate, while most have no kit at the rear apart from a canteen. Proper Battle Order would include the haversack, bayonet, entrenching tool and very often all manner of other kit such as respirators and capes. These men are far too lightly equipped, as any veteran will testify. The weaponry is OK, though there is not the variety that other sets include. Here all the men carry rifles, Sten or Bren guns, all of which have been well sculpted however. The set includes no heavy weapons, unfortunately. These are reasonable figures that are spoilt by the close-fitting uniform that makes them look slightly absurd, and the lack of normal equipment. However they could still be useful and include several poses such as the stretcher party which are not to be found in any other British Infantry set, although several much better sets have since been made by others, and even Airfix themselves have more recently had another go (not entirely successfully) at depicting this subject.